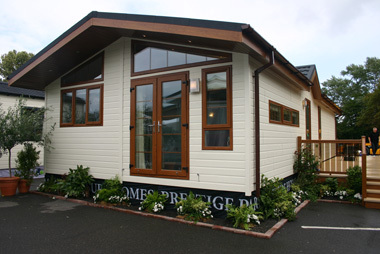 Prestige Park & Leisure Homes launched its latest twin unit holiday lodge at this month’s Caravan Extravaganza in Cottingham. 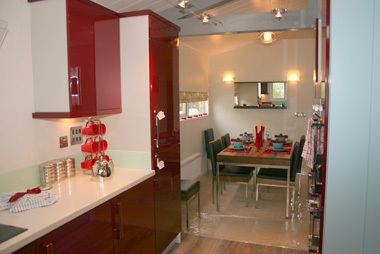 Called the Matrix Deluxe it is has two double bedrooms and one single and has been built to residential standard BS3632. The exterior has been clad in cream coloured Canexel which contrasts well with the brown windows, door frame, soffits, gutters and downpipes. The front door leads directly into the daytime living area where the most striking feature is a large centre column housing the fire. The column actually helps separate the kitchen and dining areas from the lounge although in reality they make up one large rectangular space. Vaulted tongue and grooved ceilings are yet another feature of the Matrix which the designers have accentuated in the lounge and adjoining areas by including exposed roof trusses. In the end wall of the lounge area is a pair of French doors above which is a triangular window unit which together with other windows helps make the area light and airy. Opposite the lounge is the kitchen which has been superbly equipped with just about every appliance anyone could ask for including a dishwasher, washer/dryer, and a fridge/freezer. The eyelevel oven has been built into the centre column on the opposite side to the fire, whilst also unusually, the work surfaces are cream coloured, contrasting nicely with the red of the cupboard doors. 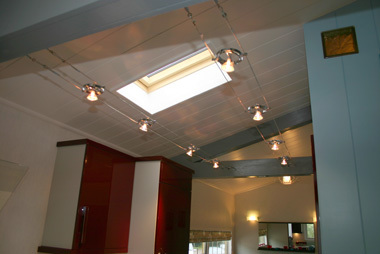 A Velux window has been fitted in the ceiling, but another feature which we very much liked was the halogen downlights. Instead of being fitted in the ceiling they have been fitted on parallel cables making it easy to adjust their positions if required. Adjoining the kitchen is the dining area which although designed for six people, could take eight without any problem. From the kitchen a corridor leads to the three bedrooms and bathroom. 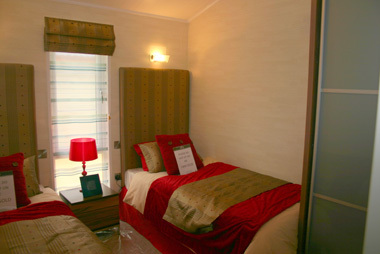 The first bedroom on the right, is a double with two 3ft single beds with tall padded headboards above which are reading lights, whilst between them is a bedside cabinet. Above the cabinet is a tall window unit and opposite the end of one of the right-hand bed as you enter, is a freestanding wardrobe with two sliding doors. Across the hall is the third bedroom which although designated as a single was more than large enough for the 3ft wide bunk beds. Spanning the width of the room was a huge wardrobe. Next to the double bedroom is the Matrix’s shower room. 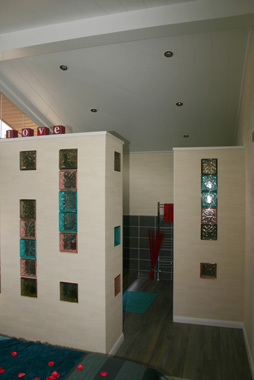 It is half tiled with the shower cubicle on the end wall. The low level toilet has been fitted midway between the shower and the vanity unit on top of which is a circular glass washbasin. The washbasin is about the only thing we would criticise in the lodge since we feel that it will need constant cleaning to avoid a build up of scum. Above the washbasin is a mirror unit with integral LED lights. As the shower cubicle is on the end wall it hasn’t been possible to include a window here but the designers have overcome the problem by fitting a Velux unit in the ceiling. At the end of the home is the main bedroom which doesn’t just have an en suite, it has an en suite bathroom which would not be out of place in a millionaire’s home! 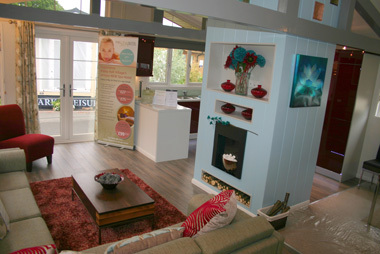 The bedroom is separated from the en suite by two walls each having a number of inset glass blocks. 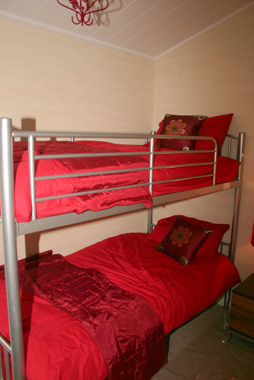 Either side of the 5ft double bed is a bedside cabinet whilst opposite the bottom of the bed is a large aluminium framed wardrobe with two sliding doors. As well as clothes, the home’s consumer unit has been fitted here and we were pleased to note it is at low level where it can be easily accessed. But it is the en suite bathroom which above all else is the feature most likely to impress. 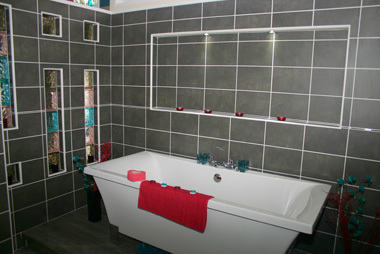 The full size rectangular shaped bath has been fitted on a plinth with LED lights, whilst the walls are fully tiled with large grey tiling. Above the bath is a large alcove plus others elsewhere into which the glass blocks have been set. As a result the overall effect is nothing short of stunning. We should mention also that above the tiling behind the bath is another triangular window similar to the one in the lounge. As in the shower room, the washbasin has been mounted on top of a vanity unit, and again, it remains our only criticism of the Matrix. As you would expect, the Matrix comes with all mod cons including double glazing and full central heating. It is a holiday lodge at the top end of the market which we are sure will find favour with the buyer looking for a holiday retreat which has everything he or she could desire. i would be interested in the price.